A militia is a body of civilians with military training who may be called to service in time of emergency. Historically, militias have been seen as a more politically palatable alternative to large standing armies. They have often been called out in response to non-military emergencies such as natural disasters. Militia are distinct from reservists, who are usually discharged regular soldiers who are subject to recall in time of war. The distinction between the two can become blurred. United States. The organized militia of the United States is the National Guard, whose officers and men are recruited by individual states but trained and equipped under the direction of the federal government. Because the United States never suffered a large-scale invasion, National Guard divisions were shipped overseas after being called to the colors. All received additional training before being committed to combat, and many performed well. Others showed the effects of lackluster leadership, inadequate training, and the somewhat older average age of their men. In addition to the organized militia, the entire body of male citizens are considered part of the unorganized militia of the United States. Because of the rural frontier heritage of many Americans, sometimes characterized as a "gun culture," a significant percentage of men who had never previously served in the Army or the National Guard nevertheless came to the Army with some familiarity with small arms. Australia. The Australian militia was known formally as the Citizen's Military Forces. They included conscripts and were distinct from the all-volunteer Australian Imperial Forces. In particular, by law, the CMF could not be deployed outside Australia. As the war progressed and manpower became shorter, the law was changed to allow the CMF to operate in New Guinea and the Solomons, then throughout Southeast Asia. 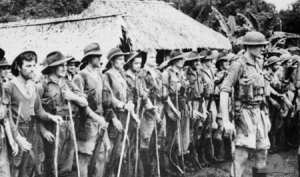 Looked down on with contempt by AIF volunteers, the CMF nonetheless fought well in some of its engagements, particularly on the Kokoda Trail and at Milne Bay. Canada. Historically, all Canadian land forces were referred to as militia, even though they were professional soldiers. Later this term came to refer to the reserve. Netherlands. Most of the Dutch troops that fought against the Japanese Centrifugal Offensive were not professional soldiers, but it is unclear whether they should be regarded as militia or as reservists. In training and capability they more strongly resembled the former. Japan. The concept of a citizen militia was foreign to the Japanese, for whom military training and the possession of arms were historically the exclusive right of the samurai. However, samurai were encouraged to settle their families in Hokkaido following the conclusion the Boshin Civil War in 1869, to serve as a ready militia against any Russian incursion from Sakhalin. The Japanese Army later adopted the concept of reservists, along with other features of European armies, and the Kwantung Army encouraged reservists to settle in Manchuria, again as a ready militia against the Russian threat. Later, as Japan itself was threatened with invasion, militia were organized in the home islands. These militia were largely untrained and very poorly armed, sometimes with nothing more than bamboo spears, and they were expected to use suicide tactics to make up for their weakness. It has been estimated that the militia in Japan numbered 28 million by the time of the surrender.